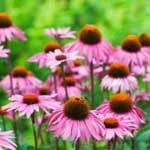 Echinacea Side Effects - Gastrointestinal and During Pregnancy! The Echinacea plant yields many natural wonders from its leaves, root and flower and has been used in medicine for centuries for many purposes. This herb has been thought to treat the common cold and other respiratory maladies, along with many familiar infections. Some people believe that taking a certain Echinacea dosage at the first symptoms of a cold can stave off the invading bug or shorten the length of illness time. Aside from its uses in all things infection, Echinacea has also been thought to be effective against symptoms of fatigue, migraines, indigestion, pain, dizziness, and even ADHD and rattlesnake bites. Echinacea side effects are uncommon and are typically mild, however there are some things you should know about Echinacea side effects before using this herb. Pregnant and breast feeding women should not use Echinacea. Some herbs like goldenseal have been shown to have potentially dangerous interactions with the developing fetus, and goldenseal side effects can include brain damage to newborn babies. Echinacea and goldenseal are different in that goldenseal has been proven to be unsafe for pregnant or nursing mothers while Echinacea is simply not advised. This is because there is no proper testing done on many supplements, including those between Echinacea and pregnancy, and particularly none done on pregnant and nursing women. As such, avoiding Echinacea during pregnancy is the best option, unless your doctor advises otherwise. Remember that if you choose to use Echinacea during pregnancy that many of the common side effects of this herb can be exacerbated such as joint and muscle aches and itchiness and rash, symptoms commonly reported in expecting mothers. Gastrointestinal troubles are another commonly reported item under Echinacea side effects. These can include vomiting and nausea along with stomach pain and diarrhea. Many of these Echinacea side effects subside quickly, however some, like an unpleasant taste in the mouth, may linger. Because the digestive tracts of pregnant women are more susceptible to stimuli, they may encounter a more aggravated form of these generally mild symptoms. If you are considering herbal supplements of any kind, talk to your health care provide to ensure that they are safe for you to take and that you do not take any medications or have any health conditions that might interact in a negative way with the items you have selected for natural healing.